WHAT ARE YOU UNDER THE INFLUENCE OF? Recently, I have been called a ‘Social Media Influencer’. I see that term a lot lately. It forced me to take a look at what is influencing me. When you look at what you read, listen to and who you hang out with it is easy to see what may be influencing you. I know a lot of you may be thinking, “Not me I am too strong to be influenced by anything!” Congratulations if that is true, but I believe to at least some degree we are influenced by all of the things mentioned above. Currently, there is an election going on in this country which means an abundance of ads exploring all of the negative situations that politicians have brought to us. There may be a small smattering of promises of what the candidate will do for you, but mostly just want their competition will not do. With our ears being filled to capacity with such drivel we can find ourselves being a bit drained at the end of the day and certainly not filled with hope. Influence can be subtle as well. Like the few glasses of wine you had with dinner that do not seem to affect you until you stand up to go to the bathroom. Influence can creep into your life without you even realizing it. Move to another country, or even to a different part of your country for a year and it would be shocking if you did not pick up an accent or dialect from that region. One of the most difficult things people will admit is the influence the people around them have. “I am my own person!” They proclaim. That may be true and you may be very good at staying true to your values, but as many studies have shown, we are usually a composite of the 5 people we spend the most time around. If you spend your days around people who constantly eat junk food, eating a salad once or twice a week may feel pretty healthy. start hanging around people who take their health and fitness seriously and you may feel differently. This is why it is important to include driven and motivated people in our inner circle. The great thing about all of this is we have complete control over what may be influencing us. We can turn off that news channel and pick up an inspiring or motivating book. We can stop subscribing to pointless political or drama-filled websites and join sites that will add more to our life, fill us with joy and help us become the best versions of ourselves. I gave you a great example in Monday’s post. If we know we have people in our lives that are not the best influence, we do not have to get rid of them, but perhaps balance the time we spend with them with someone we know would bring out the best in us and not the stress in us. A great way to begin to change what we are under the influence of is to compile a list of all the major things we do daily. Do we watch a certain television show? Visit a certain website? Talk to certain people? Then on the list, honestly decide if that item is a plus or minus. Write a plus or minus next to that item. When you are done look at what you could do to limit or replace the minus and grow or add to the plus. Become intoxicated with love, laughter and success. If you recall, a few weeks ago I was skeptical that my writing was having the desired effect. It is my wish that I reach people and help them see the beauty in themselves, others and a the world around them. What seemed to be a lack of engagement had me pondering whether my efforts would be better suited elsewhere. After all, this month we will be celebrating 5 years of this website and 4 years since my first book was published. When I voiced my concerns I was greeted with what was the greatest gift I could ask for. About a hundred people reached out to let me know that my writing had touched their lives in some way. Each story was unique, but each person was touched and their life was a little brighter thanks to the ideas and words we share here. For someone like myself who would just like to leave the world a little better than he found it, there is very little that could have made me happier. The good fortune and reassurance that I am indeed living my life purpose continues. I was recently nominated for ‘Best Milwaukee author’ in Shepherd Express magazine. I am hoping this will help me reach and inspire even more individuals. You can certainly help me reach that goal. A win would go a long way to bringing these words of positivity and hope to those who need it most. 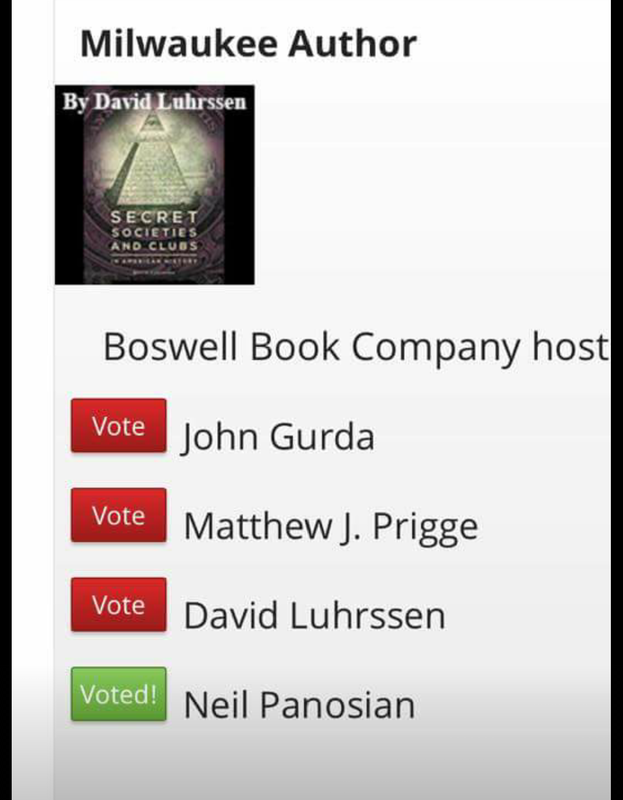 If this is something you would like to be a part of, I humbly ask you click the link at the bottom of this post and go to the ‘Arts and Entertainment’ category and vote ‘Neil Panosian’. The beauty of this being an online affair is that you can vote from wherever you may be. Whether it is West Allis Wisconsin where I live, or even in India, Jamaica or wherever these words inspire you. Working together we can certainly bring this message of inspiration and positivity to those who are hurting or who have given up hope and find themselves in a dark place. I will certainly use my title as ‘Best Milwaukee Author’ to help as many people as I can. This can only happen with your help. Together we will make the world a better place for everyone. P.S. – While you are on the voting site, if you would also go to the ‘Milwaukee made food and beverages’ and vote for my lovely lady Margie Story for best cupcakes I would be most grateful. Her delicious treats bring smiles to the faces of so many, and she puts her heart and soul into each of her creations. IT’S TIME TO VOTE FOR SOMETHING FUN! Forget all our differences for Trump and Hillary! Forget empty campaign promises. I’m humbly asking for your vote for best Milwaukee author. So, if you enjoy what you read in this blog, or have read my book A Happy Life for Busy People I ask that you be kind enough to cast your vote for me. You do not have to live in Milwaukee, you do not have to show an ID and you do not even have to leave the comfort of your own home! There is no political agenda to worry about and nobody will unfriend you if you do. So if you enjoy what I write here is all I am asking you to do. Go to http://www.shepherdexpress.com/bom16 or click the link at the bottom of this post. Then go to the arts and entertainment category and select Milwaukee author where you will see the screen above and click on yours truly! When I found out that I was voted one of the four finalists for this year there was one emotion that came over me. It was not pride, even though to be so recognized is truly something to be proud of. It was not arrogance, although once again being selected as one of the four best authors in the city made me feel pretty good! The one emotion that popped right into my head was gratitude. I cannot explain how grateful I feel enough wonderful people cast their votes to get me that far. So if you were one of those people I do wish to thank you. With you vote again and with the help of others we will come out on top. Throughout my life my mission has always been to help others see the beauty in themselves, others and the world around them. I strive to do that very thing in this blog, in my books and in my live seminars. With the exposure that winning would grant me I feel that I could help even more individuals reduce the stress and increase the joy in their lives and I can only do it with your help. So I wish to say I big thank you for those of you who have already voted, and thank in advance all of you who will vote. PS While you are there voting if you would be so kind as to click on the ‘out and about’ tab and vote either place I DJ at (HD hideout or Graingers) for best karaoke bar I would be further in your debt.